Eggs are the ultimate make-ahead, pack-for-the-road, nutritious and inexpensive sustenance. Click here to see the video which shows you how to make sure they cook without cracking, and are easy to peel. Also crucially important if you are planning to dye eggs: you cannot boil them in an aluminum pan. You must use stainless steel or glass. 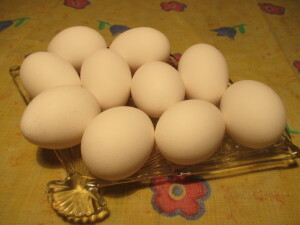 Eggs boiled in aluminum will not take the dye. Better news – US Health and Human Services and the USDA have updated recommendation on dietary cholesterol, and you can eat eggs with confidence! Enjoy!